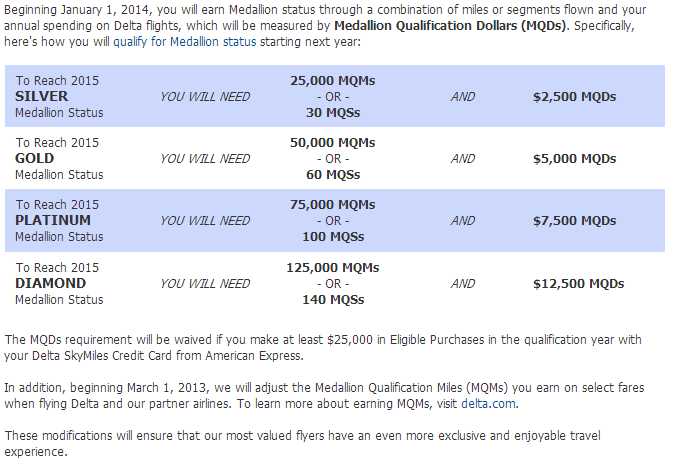 There are some nuances about how they calculate “Medallion Qualifying Dollars” but I’ll leave those for another post, closer to when the program actually takes effect. For the curious, more information is available on Delta’s website. Good for many business travelers. In general, I would expect that this will be good for many business travelers. Most business travelers travel at peak times, when airfares are generally higher than average. Most business travelers will meet the revenue threshold for their Medallion level. This change will certainly make it harder for leisure travelers to earn status, which means that business travelers’ upgrades will clear more often. My current project has me flying 2900 miles a week, with an average ticket price of around $500. By August, when my current project ends, I’ll have flown about 80,000 miles and spent about $14,000 on Delta tickets. Add in a trip to Moscow, some rollover miles, and one or two quick weekend trips to Europe and I will be well on my way to earning Diamond again. Bad for “mileage runners” or business travelers in cheaper markets. If you earn status flying mostly on low-value tickets, this change is not good for you. Last year, I earned Diamond Medallion status on Delta in part by flying to Singapore for $500, South Africa for $700, Tel Aviv for $1000, and Germany for $600. Some higher-value domestic travel was included, but I was able to amass a huge pile of medallion-qualifying miles on the cheap. My Delta spending was nowhere near the $12,500 threshold that will be required in the future to keep Diamond status. How to get around the mileage requirement. Delta does offer an alternative to the spending requirement: Spending $25,000 on a U.S.-based Delta-branded American Express credit card. Personally, I don’t like this alternative because I can get much more value by churning credit cards or by using my Starwood Amex and USBank Cash+ Visa. If you get creative, you can effectively buy your way out of this requirement for just shy of $700. Alternatively, there has been some speculation on FlyerTalk that you may be able to avoid the requirement by using an address outside the United States. I would be wary of using this loophole; Delta may use criteria other than your address to determine whether you are U.S.-based. Also, I would expect this loophole to be closed. The future may bring bad things. Delta’s step toward a more revenue-based frequent flyer program may be the sign of more to come. I am most worried about the move to a revenue-based mileage earning and redemption system a la Southwest Rapid Rewards. Under such a system, the value of miles could go down substantially. (I probably wouldn’t be enjoying as many international business class award tickets.) This move by Delta and the recent devaluation of the Starwood cash and points chart are stark reminders that miles and points are not an investment. The best advice for those seeking to maximize the value of their points and miles: Earn ‘em and burn ‘em! January 25, 2013 in Delta.